St. John’s, Antigua. 16th September 2010. As part of an ongoing initiative to increase occupancy rates for the smaller hotel properties in Antigua & Barbuda, the UK Office of the Antigua & Barbuda Tourism Authority is hosting two representatives from UK consulting firm PL Consulting. PL Consulting has considerable experience of marketing small properties to the UK market and currently represents Intimate Hotels of Barbados in the UK market. 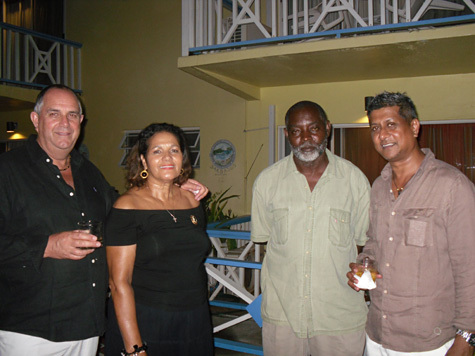 Peter Lampkin and Evan Sanassy of PL Consultants arrived in Antigua on Saturday 11th September 2010 and have been visiting the small properties of 50 rooms or less which comprise the Very Intimate Places (VIP) and the Unique Properties. “I have been very impressed with the properties that I have seen. I know that they will appeal to the UK market and I am looking forward to formulating a comprehensive plan of action to market these properties.” Said Peter Lampkin. The Tourism Authority hosted a welcome reception for the two consultants on Monday at The Anchorage Inn where the consultants were introduced to the small hoteliers. The reception provided an opportunity for the hoteliers to outline their objectives and concerns to the consultants. “We are committed to assisting the small hotels because we recognise their huge potential. There is a sizeable segment of the travel market that is looking for smaller, more intimate accommodation. Properties meeting that need can make a significant contribution to our tourism product.” said Kimberley Bowers, Marketing Manager, Antigua & Barbuda Tourism Authority. The Ministry of Tourism arranged for the consultants to visit a wide cross section of properties during their stay. In order to ensure that all of the hoteliers got an opportunity to meet the consultants, a general meeting was arranged courtesy of The City View Hotel on Wednesday 15th September 2010. The consultants are expected to present their marketing plan to the UK Office ahead of the upcoming tourist season.